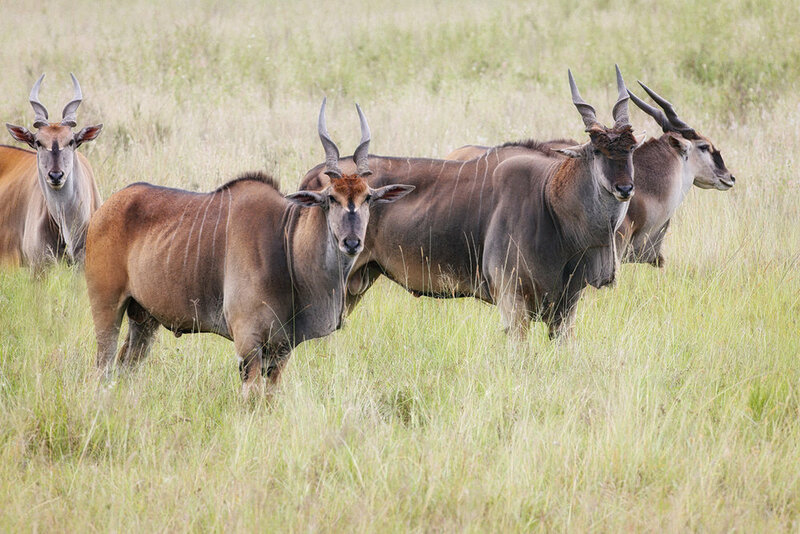 Eland - a large spiral horned antelope more shy, and more rare than others. Long the destination of safari seekers, Kenya offers magnificent wildlife in an increasingly modern context. This page contains a selection of images from visits in 2011, '12, '13, and '14. Kenyan tourism continues to develop and Kenyan hospitality remains strong and warm. There are gorgeous lodges and vast preserves in Kenya with still large populations of accessible animals; there are also many other visitors present to see them. Sticking to the shoulder seasons and exploring less familiar parks meant we enjoyed our visits enormously. After breakfast we visited Hell's Gate NP. The drive in was all we had hoped for; a wide variety of animals and birds and no white vans. At the Visitor center we took a trek with a game ranger. The looming Cliffs and gorges were created as the water from the Rift Valley began to drain. The channels cut by water are truly beautiful. We spent a couple of hours wandering along the trickle of water in the bottom of the canyon until we came to a tiny opening through which the original water had escaped. After breakfast and breaking camp we proceed to Lake Baringo for a sundown boat ride to view hippos and crocodiles. While they were the advertised attractions the real stars were pied kingfishers and black-faced weavers. In our small boat we were able to drift under willows and watch as weavers actually constructed their nests. The same willows provided perches for the kingfishers who hoovered and returned over and over. We bought a fish from a local fisherman straddling a bamboo raft to use to attract a fish eagle. All went as planned including almost getting stunning shots of the eagle taking the fish from the water. Dinner and overnight were at a campsite on the edge of the lake. At night the hippos came out of the water and grazed beside the tent. After breakfast we spent an hour or so photographing along deep orange-red Baringo Cliffs which were home to many species of bird including white-bellied goaways, blue-naped mouse-birds, and bristle crowned starlings. We also photographed black faced vervets and rock hyrex. For those who love birds this is an especially great place. We drove south the next day to Lake Bogoria to see flamingos. We were not disappointed. Thousands of flamingos waded the shallows and provided superb aerial displays as they landed and took-off. After breakfast we took a long drive across the Rift Valley to the Kakamega Forest. Kakamega is the only remnant in Kenya of a tropical rainforest ecosystem which once stretched across Central Africa to East Africa. The Forest is reported to have over 330 species of birds, 380 species of plants, 400 species of butterflies, 7 species of primates, other animals include chameleons, skinks and lizards. During our guided walk in the Forest with a local guide we were rewarded with bird, butterfly and primate sightings. This was mostly the result of the guide's sharp eyesight. Binoculars are a must here. The Reserve is under strict protective management. We stayed in a very nice KWS cabin with very welcome hot running water. After breakfast we made a long drive back across the Rift Valley to Kisumu. We had planned on a fishing boat ride on Lake Victoria but gusty winds kept us ashore. However, the landing area we did visit provided wonderful photographs of both fishing and charcoal boats arriving. These were graceful, small, single-sailed boats selling to locals. We camped at the Impala Sanctuary on the shores of Lake Victoria (with a large group of KWS trainees). The Impala Sanctuary may be KWS's smallest park, but we were delighted to walk around photographing birds and be surprised by wandering impala and zebra emerging from footpaths and hedgerows. There are caged animals in the park but we didn't visit them. We did meet a group of happy uniformed school children. Maasai Mara was recent[y named the 7th wonder of the world. It is Kenya's most well know park and may be the best known park in Africa. The Maasai Mara (referred to as Mara) is 320sq Km open grassland dotted with acacia trees. It is watered by the Mara River which forms the border between Kenya and Tanzania as well as the border between Mara and Serengeti Park in Tanzania. The Mara river is where the spectacular wildebeest, zebra and antelope migrations occur every year in July and august. Mara offers a chance of seeing the big five (elephant, lion, rhino, buffalo and leopard) besides other animals like giraffes, zebras, gazelles, impalas, elands, hyena, cheetahs. The first day we did an all day game drive with a cold field lunch. In the Mara it tasted great. We were rewarded with hundreds of wonderful photographic opportunities. One highlight was coming on to a female lion with three small cubs. On the second day we did something which may have never been done before. We visited a Maasai village like thousands of other travelers. However, on our visit we went inside the village to the livestock yard (the only clear space) and set up a field photo studio. With one tree as our prop we photographed Maasai warriors, small children, mothers with babies and one elderly man. And, we handed each person we photographed their 4x6 photo, inside a plastic envelop. At first they weren't clear on what we were up to although our guide had explained it. However, as the first prints came out of the printer and were given to the owner the crowd began to grow. We printed until the battery died. That evening we printed until late into the night to be able to take more prints to the village the next morning. All in all, a very rewarding experience. After a notably good breakfast in our small hotel we met out guides for the trip and drove 8km to Nairobi National park. This park is a historical game area now almost surrounded by the largest city in Kenya. The southern side of the park remains open so the game can migrate and range free. The park is home to most of Kenya's wild attractions - black rhino, lion, leopard, cheetah, hyena, buffalo, giraffe, zebra, wildebeest, elands and over 400 species of birds. An early departure from Nairobi took us into the bush country of Amboseli National Park - home to the legendary Maasai tribe. We opened the tops of the vans for a game drive enroute to the lodge. Amboseli is big game country, famous for large herds of elephant, for lion, cheetah, antelope, zebra, wildebeest, buffalo and giraffe. We checked into the first of the three Serena resorts we would use during the trip just in time for a delicious lunch. After lunch we set off for another game drive past Kilimanjaro, Africa's highest mountain. Visible from the lodge and the park, its iconic peak remained mostly obscured by clouds during our stay, giving us only glimpses of snow. Meanwhile below the park itself was lushly green under dark blue clouds that made a beautiful setting for elephants and their egrets. Serena Lodges: All of these lodges were lovely, comfortable, and offered every desirable amenity imaginable inside a game park. Rooms did not contain tvs, radios, or wifi (although wifi was available in lounge for a price). Instead they boasted luxurious local, original, and tasteful decor, quiet airy rooms with balconies, western bathrooms and bottled water. In each we enjoyed extensive fresh and delicious meals. Each morning after breakfast we set off on a game drive,. Our afternoons varied. We visited a Maasai village. Maasai warriors are famous for their legendary prowess in battle and single-handed acts of bravery in fights with wild animals. This visit featured singing and dancing, which are part of the Maasai daily activity. We also visited a school room of small children and were led through a village market.